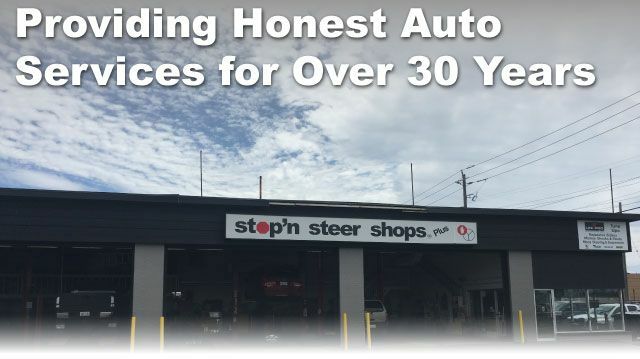 At stop’n steer Shops Plus, we’ve been Thunder Bay’s trusted name in full-service auto repairs for over 30 years. Many of our customers are referred to us following a negative auto repair experience in the past, usually involving unnecessary parts or repairs. At our locally-owned and operated shop, we have built our company on a solid foundation, with honesty at its cornerstone. This means when you need parts or repairs, our mechanics offer honest, professional advice to help you make informed decisions about your auto’s service needs. Learn more about the team at stop’n steer Shops in our “About Us” section. At stop’n steer Shops Plus, we know what customers want in their auto service; fast service, good prices and attentive staff, as well as service and repairs that are done correctly. We’re known for our efficient mechanic services that get you back on the road, quickly and safely. On average, we can provide same-day service and repairs as long as your vehicle doesn’t require a specialty part. And, we only use top-of-the-line parts in completing your repairs; never cheap parts that jeopardize the safety of customers. With stop’n steer Shops Plus, we offer general auto repairs, service and parts to help you get the most out of your car or truck. Whether you need brakes, suspension, general maintenance or an oil change, our friendly, knowledgeable Class A mechanics are here to serve your automotive needs. For our commercial customers, we offer you the same great auto services we’ve provided Lakehead residents for over 30 years. All repairs are covered by a national warranty through Unipro. For superior auto repairs, inspections and maintenance, contact us today! stop’n steer Shops Plus offers on-site safety inspections approved by Ontario’s Ministry of Transportation.